The fabulous Alhambra fortress in Granada, jewel of Islamic architecture in Europe, has been swindled out of millions of euros by a ticket scam, allegedly hatched by its doorkeepers, travel agencies, a tour guide and a branch of a major bank. Spain's most spectacular tourist landmark was almost brought to its knees by an €8m (£7m) fraud, criminal investigators reported at the weekend. Up to 50 people are implicated in the scam, which involved 800,000 faked or unauthorised entry tickets doled out over three years in a process described by investigators as "anarchic and uncontrollable". The Alhambra, the medieval symbol of Muslim rule in Spain with its breathtaking beauty and spectacular hilltop setting, has attracted visitors for centuries. The American writer Washington Irving lived within its ruins to write Tales of the Alhambra in 1829. Bill Clinton visited in 1997 to share with Hillary and Chelsea what he remembered from his student days as "the world's most beautiful sunset". And Salman Rushdie's epic novel The Moor's Last Sigh, ends with a paean to "the glory of the Moors, their triumphant masterpiece ... Europe's Red Fort". 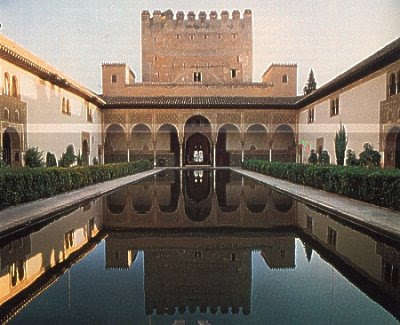 An estimated three million people visit the Alhambra every year. But not all receipts were finding their way into its coffers. The fraud has reportedly plunged the institution into a crisis bordering bankruptcy. Members of the Alhambra's staff, a senior guide and the BBVA bank are accused of selling tickets to unauthorised travel agents, or dishing them out indiscriminately. As a result, ordinary visitors who had reserved supposedly time-and-date restricted tickets months ahead found the Alhambra's filigree-arched chambers, its pleasure courts and water gardens crammed with tourists whose numbers far exceeded the permitted maximum. A COURT in Granada has heard how up to 800 people illegally passed through the entrance to the Alhambra every 30 minutes. A year-long judicial investigation into claims of illicit ticket sales for the 14th century Islamic palace found 10,000 counterfeit admissions were passed on to unsuspecting tourists. Magistrates in Granada were told some tickets were sold twice in a bid to cram more visitors into the Alhambra - Spain’s most popular tourist attraction. Management company Patronato de la Alhambra believes up to 38 of its employees financially benefited from this scam. The investigation also claims cashiers at bank BBVA sold up to 70 tickets at a time to one person although the maximum individual allocation is only five. A total of 46 people were arrested between December 2005 and February this year. All deny any wrongdoing.